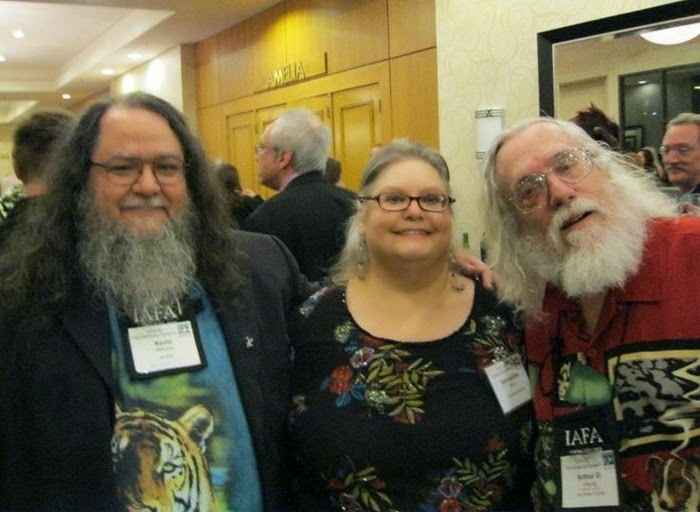 Arthur Hlavaty, right, was the fannish guest of honor at the recently-concluded NASFiC in Detroit, along with Bernadette Bosky, center, and Kevin Maroney, left. Bosky is mentioned in the acknowledgements of Robert Shea's classic novel, All Things Are Lights. Maroney is the publisher of the New York Review of Science Fiction. Longtime science fiction fan and Discordian Arthur Hlavaty, still typing away frantically, has posted his latest Nice Distinctions zine, which includes some of the best material from his ongoing Supergee blog. and also has posted The Island of Dr. Gernsback 2.0. Also, ICYMI, his excellent Robert Heinlein piece is here. I notice that Arthur is listed in the "A Who's Who of Early Discordianism," one of the features in Adam Gorightly's new Historia Discordia. Bonus science fiction link: The hot new science fiction novel, Ancillary Justice by Ann Leckie, raises a few eyebrows (fourth item, beginning with "Gregory Feeley").